Foraminiferal species diversity in the Central Paratethys — a reflection of global or local events? Abstract: The Central West-Carpathian basement, included in Cretaceous-Early Tertiary structures, shows remnants of pre-Alpine, mainly Variscan tectonics. The paper documents in-situ U-Pb zircon (SHRIMP) ages of a major Cambrian to Ordovician magmatic event, recorded in the West-Carpathian basement. Cambrian to Ordovician, less Early Silurian concordia magmatic ages, with older 525–470 Ma and younger 480–440 Ma age intervals were dated in layered amphibolites and granitic orthogneisses of the tectono-stratigraphically Upper Variscan structural Unit. The zircon cores, especially in orthogneisses, often show Cadomian, mainly magmatic source (protolith) ages, spanning 638–549 Ma, with a concordia age at 617±11 Ma. Older Proterozoic to Archean protolith ages (2000 up to 3400 Ma) are much less common. Cadomian ages highly predominate in kyanite-garnet orthogneisses, tectonically incorporated into the medium-grade metasediments of the Middle Variscan structural Unit. Kyanite-garnet orthogneisses show idiomorphic, magmatically zoned zircons with ages spanning 649–554 Ma, with concordia ages at 607±10 and 558±7 Ma, and metamorphic ages between 540–530 Ma. These ages corroborate the protolith ages of hosting metasediments with a lower intercept around 500 Ma. Early Ordovician ages were also found from the calc-alkaline metavolcanics (482±6 Ma, metarhyolite, or 476±7 Ma, metadacite) of low-grade volcano-sedimentary complexes in the Lower Variscan structural Unit. Long-term magmatic/volcanic activity due to melting of the crust and subcrustal lithosphere is coeval with the rifting of Cadomian crust and evolution of the Gondwana northern active continental margin. The ages of 430–380 Ma of layered amphibolites and orthogneisses reflect the Eo-Variscan subduction/collision metamorphic event in the Prototethyan realm, coeval with the collision of the eastern Avalonian-Cadomian/western Hunic terranes, as part of the Armorican microplate, with Laurussia/Avalonia. The collapse of the Eo-Variscan collisionally thickened crust led to partial melting within the Upper Variscan structural Unit, generating 370–340 Ma old zircons in dated metaigneous rocks. Abstract: Thermal evolution of the Ziar Mts was studied using zircon and apatite fission track (ZFT and AFT) thermochronology applied to basement and sedimentary rocks. Basement samples from the Tatric Unit of the Inner Western Carpathians (IWC) yielded cooling ZFT ages in the range from 109±5.9 to 92.1±5.3 Ma and apparent AFT ages between 33.7±2.7 and 24.4±1.7 Ma. Paleogene sediments of the Central Carpathian Paleogene Basin (CCPB) yielded apparent AFT ages of 73.2±2.7 and 49.6±1.8 Ma. ZFT data show that during early Late Cretaceous thrusting the crystalline basement was buried by a nappe pile to crustal depths with temperatures between 210 and 310 °C, where the crystalline core was metamorphosed at anchizonal conditions. AFT data revealed a complex thermal evolution, implying that after nappe stacking and metamorphism the basement was exhumed to the surface and that it was buried beneath a thick pile of sediments of the CCPB. The CCPB was inverted and the basement finally exhumed in the Late Oligocene to Early Miocene. The AFT system in the basement and CCPB samples record also a distinct, Middle Miocene thermal event, related to the increased heat flow induced by upwelling of hot mantle material and related volcanic activity. Our data support the hypothesis that the study area was part of a large CCPB basin and contradict the widely accepted assumption that the Variscan crystalline core of the Ziar Mts lacks an Alpine metamorphic overprint. Abstract: Seven micromorphic brachiopod species belonging to six genera are identified in Middle and Upper Eocene deposits from north-western Hungary. One species is new, namely Argyrotheca tokodensis sp. nov. The species Novocrania bayaniana (Davidson, 1870), Orthothyris pectinoides (von Koenen, 1894), Argyrotheca michelottina (Davidson, 1870) and Lacazella mediterranea (Risso, 1826) are reported for the first time from the Hungarian Eocene localities, while Terebratulina tenuistriata (Leymerie, 1846) and Megathiris detruncata (Gmelin, 1791) were already noted from the Eocene deposits of Hungary. Abstract: A rare late Sarmatian terrestrial gastropod fauna is described from the Gratkorn Basin. This intramontane basin developed during the Miocene at the junction between the Eastern Alps and the Pannonian Basin System. During the mid-Sarmatian, a considerable drop of the relative sea level, probably coinciding with uplift in the Eastern Alps, caused the Paratethys Sea to retreat from marginal basins and embayments. An alluvial plain developed in the Gratkorn Basin, indicated by fluvial gravel and paleosol formation. A moderately diverse gastropod fauna of 17 species inhabited this alluvial plain. The composition corresponds to Sarmatian faunas from southern Germany and the North-Alpine Foreland Basin. Taxonomically, it can clearly be distinguished from superficially similar and ecologically equivalent faunas of the Pannonian. Thus, we document the value of terrestrial gastropods as a biostratigraphic tool to date the lithologically often very similar freshwater systems in Miocene intramontane basins. The clausiliid Pseudidyla martingrossi Harzhauser & Binder and the camaenid Pleurodonte michalkovaci Binder & Harzhauser are introduced as new gastropod species. 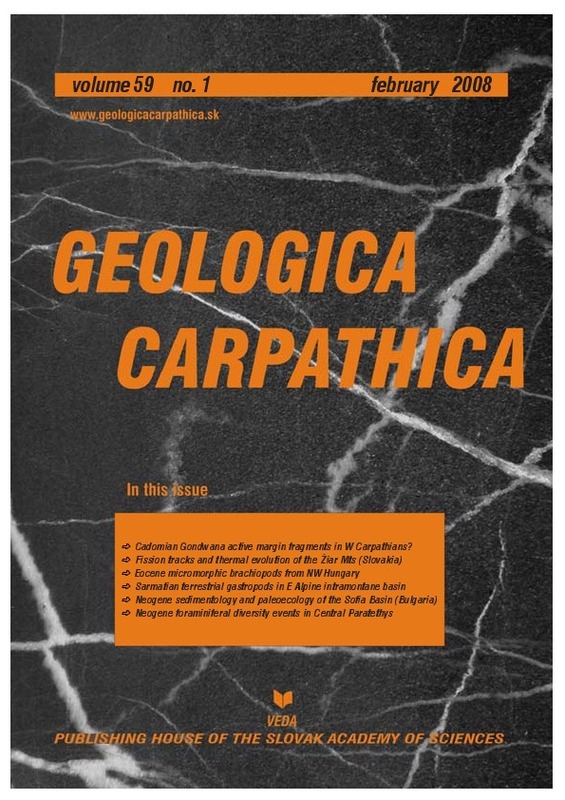 Abstract: Comprehensive lithostratigraphic and biostratigraphic investigation of diatoms, chrysophycean stomatocysts, and mollusc fauna was performed on a borehole C-14, near the village of Katina, from the peripheral zone of the Sofia Neogene Basin. The diatom flora consisted of 302 species, varieties and forms. Principal Component Analysis (PCA) was used to classify the diatom thanatocoenoses. The results of these different analyses presented here indicated three successive stages in the paleoenvironmental development of the Sofia Basin, at the end of the Miocene and the beginning of the Pliocene. Abstract: The stratigraphical ranges of the Eocene–Sarmatian Central Paratethys Foraminifera were used to calculate their species diversity (=the number of foraminiferal species in a certain time interval). Species diversity was evaluated separately for benthic and planktonic Foraminifera, agglutinated and porcellanaceous foraminifers, lagenids, oxyphilic, dysoxic and euryhaline species. In the Central Paratethys basins, six foraminiferal species diversity events were defined: (i) The Egerian species diversity maximum was reached by progressive growth in the number of foraminiferal species during approximately 15 Myr from the Early Eocene to the Egerian. (ii) The Egerian and Egerian/Eggenburgian extinction event interrupted the growth of species diversity. The beginning of extinction was approximately isochronous with the acme of small-sized reticulofenestras (calcareous nannoplankton) which are considered to be an indicator of warm water with low nutrient concentrations; (iii) The Ottnangian species diversity minimum is the consequence of a minimum number of foraminiferal FOs during the Eggenburgian and the Ottnangian (3 Myr). This was caused by isolation of the Paratethys and the progressive decrease of salinity and oxygen content during the Ottnangian. (iv) The Early Badenian species diversity maximum followed an abrupt increase in species diversity of benthic Foraminifera at the Karpatian/Badenian boundary as a consequence of a large transgression and the establishment of fully marine conditions in nearly the whole territory. Diversity of the planktonic assemblages increased gradually in the Karpatian (1.1 Myr) as a result of the opening of new sea-ways. (v) Extinction at the Badenian/Sarmatian boundary indicates rapid shift of paleoenvironmental parameters. (vi) The number of Sarmatian species represents only 29 % of the Egerian species. The composition of assemblages changed and shifted to endemic, euryhaline species. These changes can be clearly correlated with the isolation and vanishing of the Central Paratethys basins. It is suggested that foraminiferal species diversity in the intracontinental Central Paratethys basins was controlled mainly by regional paleogeographic communication/isolation events which may be influenced by global sea-level changes and partly by regional paleoenvironmental changes influenced by global climate changes.